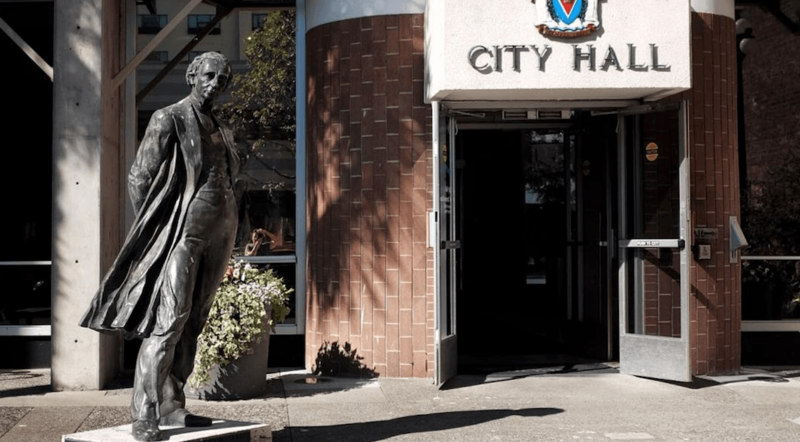 The City of Victoria is looking to remove the statue of John A. Macdonald from the doorstep at City Hall. On Thursday, Victoria City Council will be asked to support the decision to remove Canada’s first Prime Minister from City Hall, because of his role as a leader of violence against Indigenous peoples. If endorsed, the statue will be removed on August 11. “After a year of discussion, deliberation, truth-sharing, and seeking counsel from the Songhees and Esquimalt Chiefs and Councils on multiple occasions, the family decided on the first concrete action we would like to take as we continue the path of truth and reconciliation,” wrote Mayor Lisa Helps, referring to “City Family,” the group addressing reconciliation programs. Helps said that the statue will be removed and stored in a city facility until an appropriate way to “recontextualize” Macdonald is determined. Following its removal, and “an appropriate amount of time has passed (as determined by Elders from the Songhees and Esquimalt Nations),” Helps said that there will be a cleansing, blessing and healing ceremony held in the space where the statue formerly stood. “So proud to be Canadian today! Well done, Mayor Helps,” wrote a commenter on Helps’ post. But not everyone agrees with Helps and the City of Victoria’s removal of the statue. “John A. MacDonald was the catalyst of bringing the two founding people of Canada together. Skillfully negotiated the creation of our federation and founder of best nation on earth,” he said. “This is shameful.